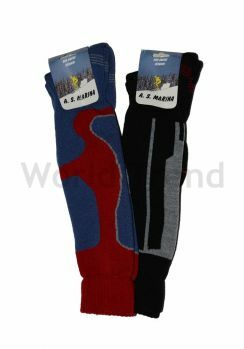 Warm ski socks for winter sports or skiing in which legs do not become cold even in the biggest snow. A wide range of ski socks for both men and women. Solid and patterned ski socks with high wool content in excellent quality! Ski socks are especially thick and warm soft socks which help you to move easily even on the coldest days. For skiing, winter sports you can find lots of colourful and black ski socks in every size and in the most fashionable colours. The winter range of our tights shop highlight winter tights, knee socks which are knit endurable and long-lasting and keeping your legs warm, they are fashionable and they have a place in the city. Choose ski socks and the winter days will not mean surprise for you! 23 x Copyright 2011 - 2019 © www.tightslove.com - all rights reserved!